I have been away from Vancouver since August 1. This year, I scheduled a beautiful summer vacation with my family in Maui. Certainly, after flying close to 50,000 miles during the first half of 2012, I needed a break. Especially since I have another 50,000 miles to fly during the last quarter of this year! Don’t get me wrong. I am not complaining. Not at all. I am grateful for my job and I love my work at MonkeyMedia Software. I really do. But, I have been running hard. Really hard. Growing a company uses an incredible amount of life energy. I am positive you can relate. I mean, so much goes into providing great customer service, generating sales growth, managing costs, margins, bankers and keeping our people interested and motivated towards our higher purpose in business. So much goes into keeping shareholders informed and policies and procedures enforced not to mention trying to understand changing market conditions. It just takes a lot. After I arrived in Maui, it took me a whole week just to get my brain to stop buzzing. A whole week to figure out how to get that voice in my head to simply stop the trivial chatter that hits my ears like a heavy rainstorm. Why does that voice always focus on trivial matters? It’s silly really; especially when you already have everything in place. I have to work so hard at home to manage that noise. An entire week went by before that noise in my head finally settled down and made space for more important life matters. Important thoughts. I forgot that I was actually capable. So, this year, my vacation in paradise really got me thinking. After snorkelling with turtles, seeing bottle-nose dolphins at Molikini, hiking on volcanos and simply gazing at the night sky, I finally created some space in my brain to think about the things that really matter in my life. 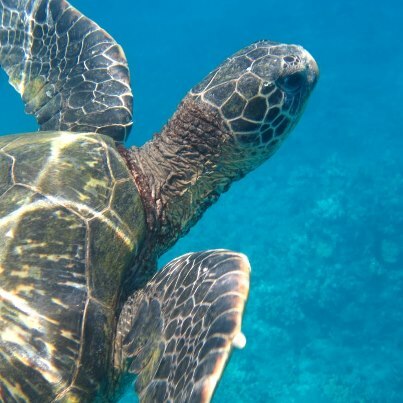 Before I tell you about that, check out my turtle friend that I met while floating in the waves. He’s so friendly, so beautiful and just so graceful. Made my day! I am proud of this picture that I took with an underwater digital camera. Great technology these digital cameras! I’ll pause here for a moment. Ok, back to the things that really matter. My health. That’s it really. Nothing else really matters in the end. Without it, none of it comes together. It’s not to be taken for granted. If you have your health, you have everything you need. All that matters. It’s not that nothing else is important. There are many important things. Assuming that I get to keep my health, (and we all do until we don’t have it anymore), I made a commitment to myself on this holiday that I would take a different approach to my buzzing, busy brain upon my return home next week. After all, nothing will have changed much. The emails will still pour in, the telephone will ring off the hook, money will still need to flow and people will come and go. The world just doesn’t wait. I was born an entrepreneur. For better or for worse. Born to suffer in the endless abyss of business. The pursuit of sales and the resistance of expenses. Well, in order to have any business success, for any of us, we have to struggle. It’s a fight. There is no other way. As an entrepreneur, I can tell you that the journey is long, difficult and torturous. It takes a generation to build an organization never mind a legacy. So, this got me thinking alot about my exit plan. Not today. But if not for my exit, how can my business grow? Clearly, if I am ever able to remove the business manacles from my ankles, my “ball and chain”, I will have succeeded in shaping my vision. No? If I don’t help my team reach the end goal of my exit, then I will be shackled. There is no questions about that. I’ll need to be strong. I’ll need to be more humble. More generous. More……? I have to become a better leader. That’s all. I need to let go. Yes, letting go. That’s the key. Well, I am not quite there yet. No way. Not until I have fulfilled my community obligations. That means that I will have to have delivered on my vision. My commitments to my customers, my team and my family. But with what plan? I’d love to tell you that this is all well calculated. But I can’t. I am just “winging it”. Going on intuition. Survival skills. It’s how I have always operated; and it has served me well. So, what next? I can’t continue on the same assumptions as I have for the last twenty five years. No way. The world is different! I am different! Change is inevitable. I’ve got to take it down to an actionable item. After all, that’s how I have been trained. Take action! Right? What I can do is focus on my value add. My true desire to be the best that I can be and to continue to figure out ways to add value to the world. To the lives of the people who work and play in my community and perhaps even some who I have not met. So, I continue to ponder where it is that I can add value to the conversation. How can I serve my team? My customers? My friends? My family? My community? I mean, what can I do for the balance of my time on this planet to really “step it up”? To really be a better person? To not let that voice in my head “get me”. How can I replace all those negative thoughts with positive ones? It’s going to take work, commitment and perseverance. Yes, perseverance. I took many walks along the ocean’s edge here in Maui this last few weeks. I made it a daily ritual. And as I stepped along the golden sand, I made sure that I connected with each step. The way my toes sunk and my heel marked my spot at the earth’s edge. I felt like I was a pioneer. I imagined what this coastline must have been like one hundred years ago. I felt like an explorer with each step as if no person had stepped on this beach before me. Then I looked back. 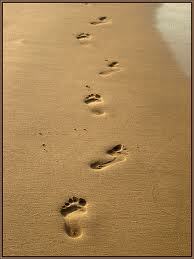 And with each break on the shoreline, my footsteps were washed away for another explorer. Here today, gone tomorrow. The passage of time as obvious as the lava flow before me. It made me wonder. What will I do to stop the trivial chatter in my head and just focus every single day on what is important in my life? My health. Drop me a line will you? Let me know what you will do to stop the trivial chatter. Nice piece Earl, sounds like you are having fun – good for you. On a more serious note, reading this made me think about my personal journey, and you are right…it’s never easy, but if you love what you are doing, at the end of the day, it is nothing short of Amazing!!! Thanks for taking the time to read and comment Chef. I have undergone a similar journey a few times in my career. As a born entrepreneur as well, I related with your message. I don’t know if true entrepreneurs really have an exit strategy. I believe it is only a pause, however long or short. As we gain experience and wisdom it is ironic that the value of our being, (entrepreneurs) shifts from a monetary one, to legacy, or “our” worth. What have we have contributed to the wold around us is measured less in dollars and more in contribution. YES this includes our families, friends, employees, partners, communities, values and everything else that you speak of. A form of currency that one, hopefully, will achieve in their lifetime. I will never forget years ago befriending a man who sold a highly successful global chain of eateries for millions, only to re-emerge as a highly successful clinical psychologist doing speaking engagements around the world, writing books, helping people. To this day I know him and I will bet that he would be asking the same questions, having the same chatter in his head and pondering similar thoughts that you have given us, if he were in the beaches of Maui. The game board might change but I will bet that you will be in the game forever. Thank God for that! Enjoy your time there, your family, and we will be waiting for your arrival in Vancouver soon. Thank you for that wonderful post you sent today. I leave tomorrow for 2 weeks – to my most favorite place in the world, with my wife and 8 and 6 year old daughters (who have been there all summer). But, unless the buzzing that I know all too well stops in my head, I won’t actually have a “vacation”. And I won’t enjoy my family at a level they so badly need me too. And I won’t get to the big thoughts, that only 2 weeks can achieve (at least for me) So your message came at the right time. I’m motivated. And glad to know I’m not alone. Great thoughts John! Enjoy your break and work hard to focus on the kids. Boloco will be there when you return! Thanks for the kind note Shayne! Glad to know you found your quiet here in Maui. See you soon! Erle, I am printing a copy of this and putting it inside the jacket of your book. Thanks for the encouragement John. If you are reading, I will keep writing. I am glad you found the post worthy enough to spend a bit of time with it!